PJ Davis, HY Lin, AA Hercbergs, KA Keating, SA Mousa, (2019) How Thyroid Hormone Works Depends Upon Cell Type, Receptor Type, and Hormone Analogue: Implications in Cancer Growth. Discovery Medicine 27:111-117. 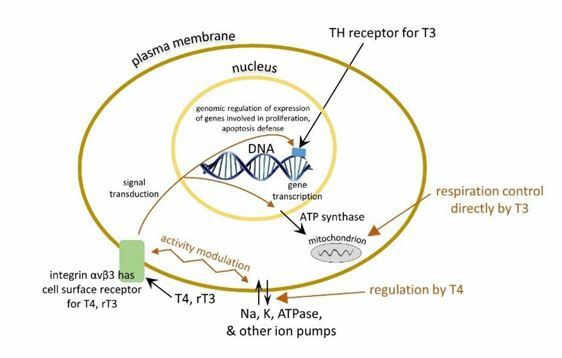 The classical molecular mechanism of thyroid hormone involves the intranuclear interaction of 3,5,3′-triiodo-L-thyronine (T3) with thyroid hormone-specific nuclear proteins and consequent specific gene expression. This mechanism prevails in normal cells. What we emphasize here is that how thyroid hormone acts depends upon the types of cell or cell-like structure, e.g., platelet, under consideration, and that cancer cells, dividing endothelial cells, phagocytes, and platelets respond to the liganding of L-thyroxine (T4) by plasma membrane integrin alphavbeta3. In intact tumor cells, T4 at the integrin can modulate the transcription of a substantial number of specific genes relevant to cancer cell proliferation, cell metabolism, and cancer cell anti-apoptosis defense. T4 may also regulate the interactions of the integrin in the endothelial cell plasma membrane with adjacent vascular growth factor receptors, modulating angiogenesis. T4 activates platelets via αvβ3 transferred from the megakaryocyte. 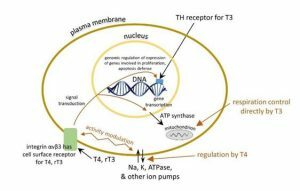 It is also possible that, in addition to T4, reverse T3 (rT3) may have actions in cancer cells at the thyroid hormone receptor on αvβ3.